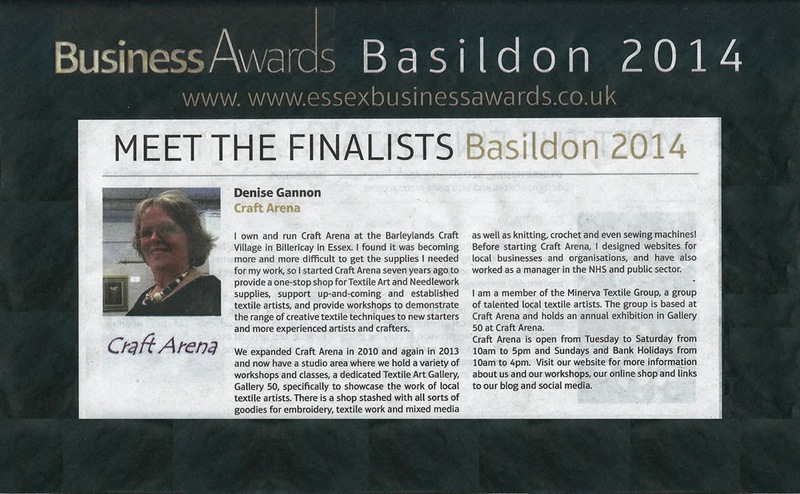 I've been selected as an entrant in the Basildon Business Awards 2014. The winners will be announced on Friday 18th July at a lavish ceremony at the Towngate Theatre, Basildon. There are five other entrants who are all very strong contenders - I'm even up against Escape Studios from Barleylands! It is a great compliment to get through to the final and does mean that Craft Arena gets a bit of free pubicity! We were featured in the Basildon Echo last night and I've clipped it here so you can read it. I'll let you know how we get on as soon as I can. I interviewed eight people for the vacancy I recently advertised in my newsletter; it was so hard to choose between all the candidates, but a choice had to be made, and a lovely lady called Jenni has started with me today. Jenni will be here most Thursdays, some weekends and Bank Holidays and as holiday cover, so make her welcome when you meet her. She may even be helping me with the blog!